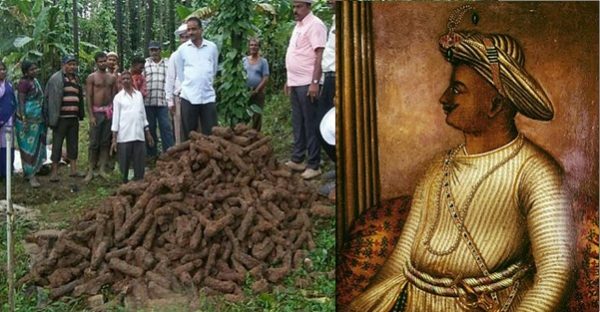 Dailymail.co.uk carries this news headlines on 31st July 2018 – ‘The rocket cache of an 18th-century Indian warrior king: 1,000 missiles believed to be among the first ever used in battle are found in abandoned well’ on the excavation of over a thousand rockets of Tipu Sultan. Excavations were done in an abandoned well at Old Bidanuru village of Hosanagara taluk in Shivamoga, some 385 kilometres (240 miles) northwest of state capital Bangalore in Karnataka. Department of Archaeology, Museums and Heritage (DAMH) took up the research and excavations. During Tipu Sultan’s times, these rockets were kept hidden in a well. The mud of the dry well smelt like gunpowder. This led the 15-member team of archaeologists, excavators and labourers to dig the well. It took three days for the team to unearth the missiles. These were in a pile. The missiles measured between 23 and 26 centimetres (12-14 inches). Interested visitors can view them; these would be kept for public display at a museum in Shivamoga. Though rockets have been in use in ancient India as depicted in the epics and scriptures, the dailymail.co.uk report mentions about use of rockets in warfare since the 13th century. In the book BAKHAR OF PANIPAT, a first hand account of the battle of Panipat by Raghunath Yadav, the Marathas took 25,000 rockets in their military expeditions. This proves that even before Tipu Sultan, the Marathas developed and used rockets. But, Tipu has been glorified here in the report as one of the first developers of the rocket. Did Tipu Sultan develop these rockets only to use against the British? If the answer is ‘yes’, it is vague. The Mysore Sultanate did involve in wars against the British in succession with signing of peace treaties in between. But both powers indirectly tried to maintain supremacy over the other and directly over the Indians. Tipu was killed during the 4th Anglo Mysore war on 4th May 1799. Within a short period of their military expeditions in Southern India, both Hyder Ali and Tipu Sultan massacred thousands of Hindus, razed almost all temples to the ground, destroyed the idols and confiscated temple wealth. They converted many to Islam. This fact is proven by numerous historical accounts. The truth about what the father-son duo had done in the Malabar region had been veiled in History text books. The major part of Tipu Sultan’s rule was spent in conducting military operations for subjugating Malabar. Wars of territorial conquest waged in Malabar by Hyder Ali Khan were intended more for spreading the Islamic faith by killing and forcible conversion of Hindus , than for expanding his kingdom. His atrocities were coupled with widespread destruction of Hindu temples. So are the recently excavated missiles a sign of Tipu Sultan’s failed attempt of murdering of more Hindus of South India?